Partly to mostly cloudy. Low near 55F. Winds SSW at 10 to 20 mph.. Partly to mostly cloudy. Low near 55F. Winds SSW at 10 to 20 mph. Windbreaks provide protection from blowing wind and snow, habitat for wildlife, and add beauty for increased property value. Windbreaks around your home or livestock feeding areas can make a difference in reducing not only wind velocity, but reducing blowing snow and dirt. They also gentle temperatures by reducing wind chill during cold seasons, or by providing shade in the summer. A windbreak properly placed near a roadway reduces the need for plowing snow and increases visibility. Trees also provide wildlife habitat. Planting trees increases property value and works well as a sound barrier. The first step is to make a plan. Consider where a windbreak is needed or where you would like trees to be planted. For a windbreak, it is recommended to have three to five rows for maximum benefit but even one row will provide some positive results. Measure the width of your area and determine how many rows you want or have room for. Decide which variety of tree would be best in each row. A windbreak needs to be dense near the ground. So select a bushy, dense deciduous shrub for the windward or outside row. Shrubs make ideal single row or double row low windbreaks around yards and gardens. They are often used for living snow fences and provide excellent wildlife habitat. They also provide the needed protection for evergreens in a windbreak. Many varieties also add beautification as they have blossoms. A different variety in each row provides greatest benefit. Deciduous trees are often used for a middle row in a windbreak. They are generally faster growing than evergreens and thus provide earlier protection. Evergreen trees are an important part of a windbreak because they provide excellent protection year-round. They should be included in a windbreak whenever possible. You can plant one or two evergreen rows on the leeward side of the windbreak. The final row could be another shrub row. Remember that three-five rows are best, but you can plant more or less as room allows. A few things to remember: Do some research, plan your windbreak carefully taking into consideration the greatest benefits from wind and sun. 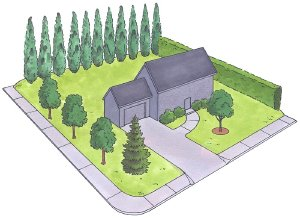 Measure your area and plan appropriate room for trees to grow. Consider irrigation and protection from animals while trees get established. For survival of your trees during planting, take precautions to keep roots damp. The most economical way to get a windbreak growing is to plant seedlings. Their success rate is very good. Seedling trees are available to order now from the soil and water conservation districts. The seedlings come in bundles of 10 trees per bundle for a cost of $35 plus tax for each bundle. Pre-order your trees now as supplies are limited. The seedlings will arrive mid to late April. Check out our website at minicassiaswcd.com where you can see detailed photos and information on the seedlings. You can also get information by coming into the Burley USDA Field Office at 1361 East 16th St., or the Minidoka USDA Field Office, 98 B South 200 West in Rupert. You can request information and order forms by e-mail at ewcswcd@gmail.com. Order forms, photos, planting instructions, and windbreak info are all available on the web site or in the offices. For more information, call 208-572-3369 or 208-436-4202. Doreen McMurray is the I and E specialist with the East and West Cassia Soil and Water Conservation District. The Minidoka, East Cassia and West Cassia Soil and Water Conservation districts are sponsoring a free bus tour featuring local cover crops.